You may remember the release of our Special Limited Edition shirts in December. Since then you have purchases nearly 300 shirts. Thank You! Our goal is to hand a check to COTS for over a $1,000 in February. The cost of the shirts are only $5.00 with $1.00 going to COTS. The shirts can be purchased at Zephyr Sportswear. Have fun and get noticed for spreading the good news in Petaluma while supporting your community. Submit a photo wearing the shirt in Petaluma and we will post them in the month of February. Be creative! maybe you are a…. Team, athlete, or coach of a Petaluma sport. 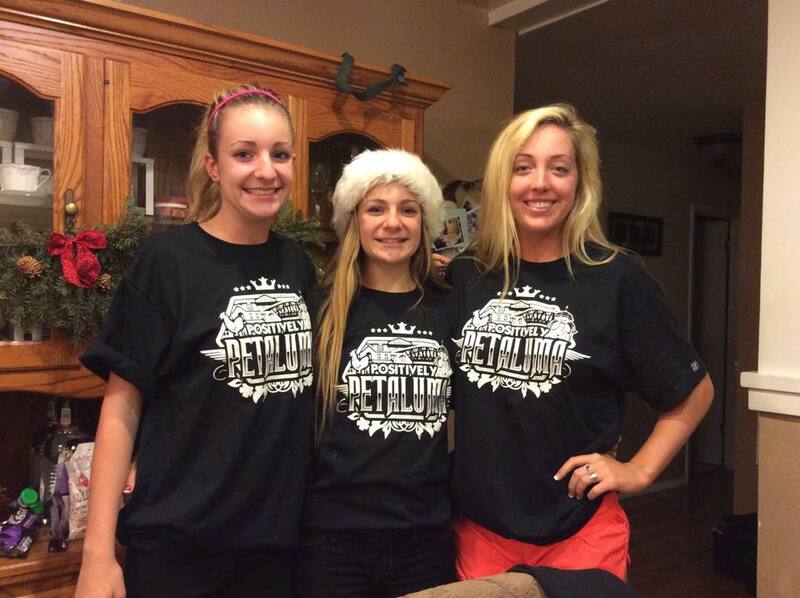 Congrats to Lisa Draper, a beautician at Studio 132 (Spa, Beauty & Personal Care) on Liberty Street in Petaluma, for submitting the first photo of Payton & Taylor Draper and Colleen Cline wearing the new Positively Petaluma T-shirts. Payton dressed it up for the holidays with a Santa hat – Awesome. You girls look great! Thanks for sharing and your donation to COTS. Get creative but please keep it clean. We are a G-rated family-appropriate safe place to get information for all audiences. Who knows maybe you too will be featured on our site and social media feeds. Over a hundred sold in just a few days. Because $1.00 for each sale is going to COTS, that means over $100 will be donated to them in February. Let’s make that over a $1,000 by January 31, 2015. Click here to get information on how to get yours.